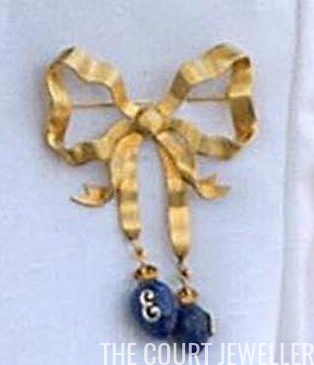 Our royal brooch spotlight this weekend is shining on another grand brooch from the Duchess of Cornwall's collection: this lovely golden bow with bright blue pendant drops. Camilla wore the brooch in public for the first time on April 29, 2005, only twenty days after her royal wedding in Windsor, during a visit to the Bharatiya Vidya Bhavan Institute for Indian Art and Culture in London. This was a period when Camilla was debuting lots of royal jewelry, much of which came from the late Queen Mother's personal collection. 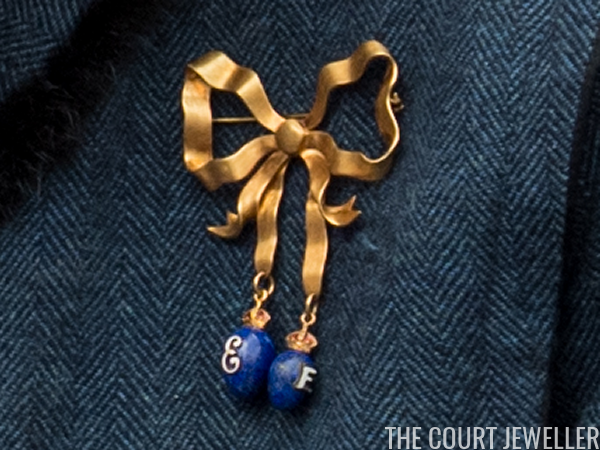 Many have suggested that this brooch, a stylized bow with an antique gold finish, is also a legacy from the Queen Mum. ...and the other drop features the letter "E" in block form. The Queen Mother's first name was Elizabeth, of course. (I initially saw the block letter as an "F," but there's definitely a third horizontal line extending from the base of the letter, so I believe it is an "E.") Both drops are surmounted by crowns, not coronets, suggesting that the piece was definitely worn by a queen. So if the brooch did belong to the Queen Mother, it's possible that it didn't enter her collection until after December 1936. 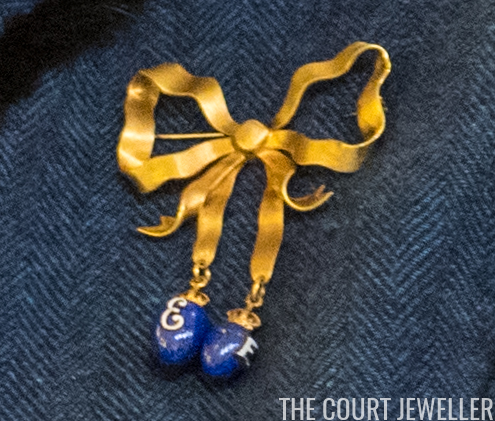 To me, the construction details of the piece in this close-up do suggest a 20th-century date for the brooch. I've seen the drops described as sapphires, but I don't think that's right. These don't have the same appearance as polished sapphires; instead, the color of the drops looks to be slightly mottled and varied, more like lapis lazuli. The drops seem to be drilled beads, which would also account for the swiveling drop on the right in these photos, where the crown and the initial don't align properly. 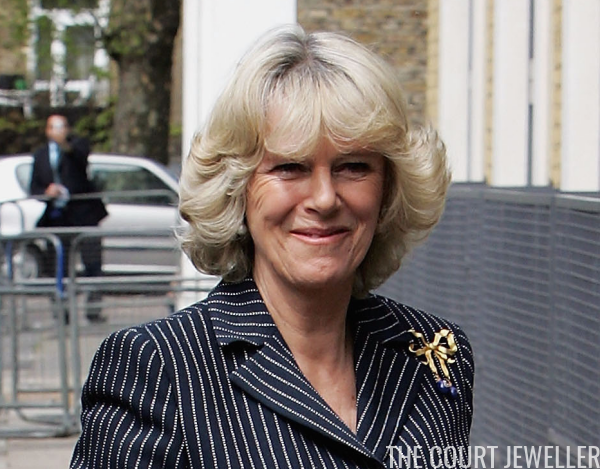 Shortly after her first appearance in the brooch, Camilla wore it again in London in June 2005 for events commemorating the 60th anniversary of the end of World War II. 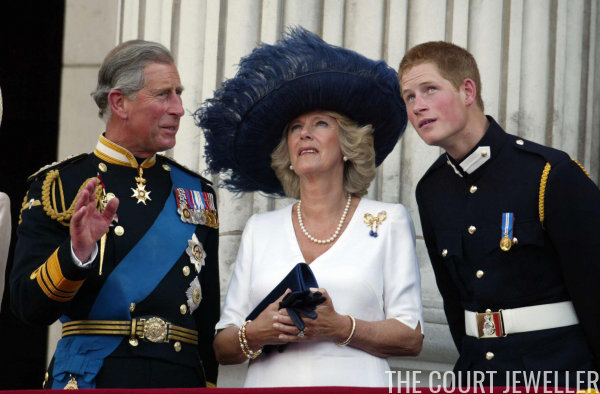 And she wore the brooch again in March 2006 during a royal tour of India. 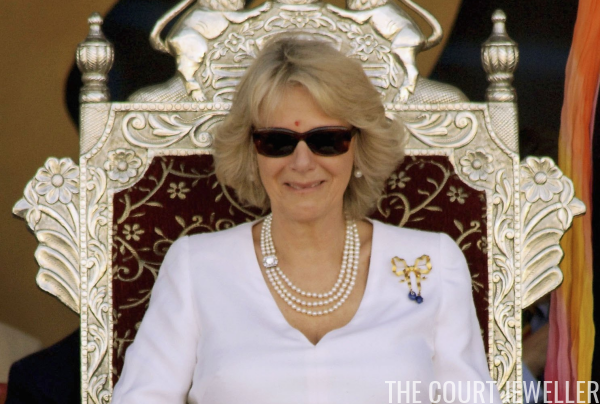 For a parade in Jaipur, Camilla paired the brooch with a jewel that definitely came from the Queen Mum's jewelry box: the triple strand of pearls with the diamond deco clasp. 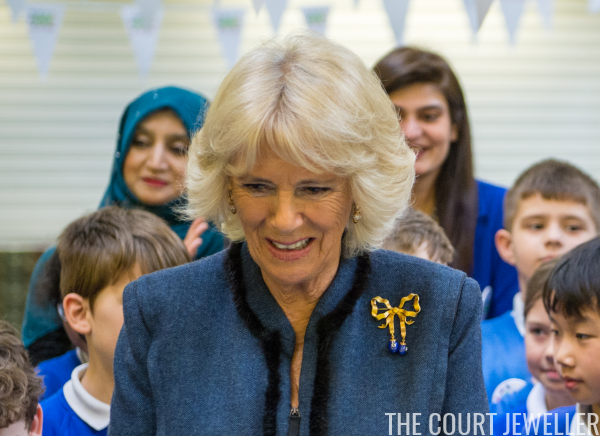 Camilla has continued to wear the brooch throughout her marriage. 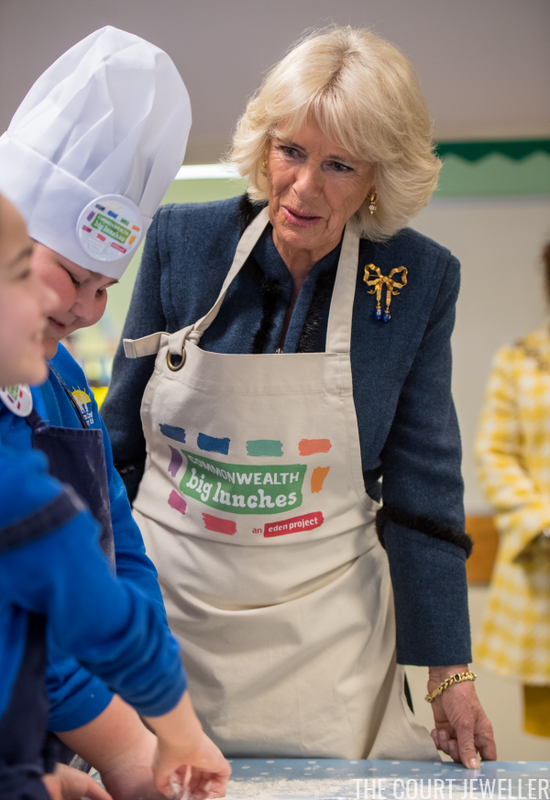 One of her most recent appearances in the brooch came in March 2018, when she wore the piece to celebrate the Commonwealth Big Lunches event at the Barn Croft Primary School in Walthamstow.